Welcome to the second day of sneak peeks of the September Sparkle Creations Rubber Stamps release! Sparkle is releasing 6 new images at midnight EST this Saturday, October 9.. Today Lisa, Piali and I are previewing Elf Oliver! Poor Oliver is going to get a complex.. for one thing, I keep referring to him as Ian.. I'm not sure why, but I do. Now I've surrounded him with pink and bling.. : ) I colored him with Copic markers and pieced his toy bag from paper from Echo Park Everybody Loves Christmas. I added some Liquid Applique to the edges of his hat and elf suit. I punched the border with my Martha Stewart Scallop Dot border punch and added 2 sizes of red rhinestones to the holes. Accessories: Scallop Dot border punch (Martha Stewart), Candy Cane Stripes embossing folder (Provo Craft), Markers (Copic), Rhinestones (Pizzazz Aplenty), Liquid Applique (Marvy), Foam tape, Thread, Sewing machine. Wow!! Lovely card Stephanie!! Echo park's ELC paper is perfect for Oliver..I used it too..hehee!! 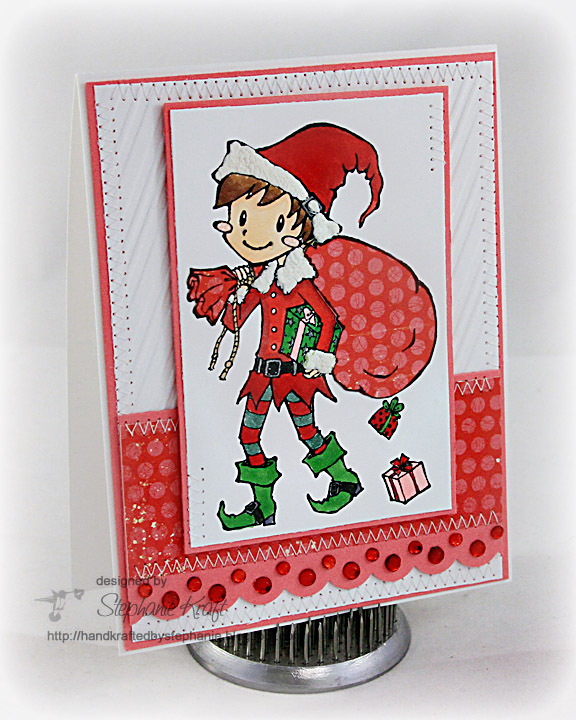 love the embossing on the background! Love the Paper Piecing on this! Just darling! I love all the red on this! Cute card! You did an awesome hob coloring that sweet image Stephanie! Very sweet! Love the striped background and the border.